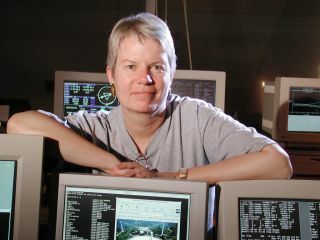 Astronomer Dr. Jill Tarter, longtime director of the Center for SETI Research at the SETI Institute, and also holder of the Bernard M. Oliver Chair for SETI. Astronomers, actors and a host of other science-minded professionalswill descend on California this weekend to celebrate the 50th anniversary ofthe SETI Institute and its mission to scan the universe for signs ofintelligent extraterrestrial life. What would happen if an Earthling astronaut encountered aVulcan? Would they chat about the rigors of spaceflight, or merely chuckleabout one another?s misshapen ears? Anyone who can make it to California?s Silicon Valley theweekend of Aug. 14-15 can learn the answer to this portentous question. The SETIInstitute, which is best known for its hi-tech search for alien signals,will be hosting a public event called SETIcon: A massive smorgasbord of talks,panels, and one-on-one interactions ? all dealing with the science and science-fictionof extraterrestriallife. Sci-fi conventions ("cons") are an establishedcultural phenomenon. They?re well-known, well-respected, and well-attended. I?vebeen to quite a few, and it?s hard to gainsay the fun of spending a few daysexperiencing a fantasy existence ? the life we might lead if only we were borna few centuries hence, when interstellar rockets are as common as commuterbuses, and your job description is to defend the United Federation of Planets. But sci-fi is more than fairy tales for nerds. It is thehypothesized history of the future, a prismatic view of what humankind mightbecome. Some people consider it valuable for imagining products or deeds ? whycan?t we build the "Star Trek" tricorder or massive, artificialhabitats in space? Others see this genre?s worth in offering us cautionarytales of what could go wrong, thereby potentially helping us to avoid societalsuicide. The genre?s been around for more than a century, if youcount (as you should) the work of Jules Verne.? But in Verne?s day, rocketsexisted only in a few people?s minds, and the idea that we might actuallyalight on other worlds was as plausible as expecting monkeys to pen poetry. But that was then, and this is now.? Science has caught upto much early sci-fi, and in some cases rendered it obsolete or even quaint(think of "War of the Worlds," with its marauding Martians).? Nonetheless,and despite a half-century of the space age, we still can?t send a probe to ablack hole nor dispatch a cohort of Lycra-wrapped astronauts to boldly go insearch of gnarly-headed aliens. In this endless leapfrog of science-based imagination andresearch accomplishment, where do we stand today?? At SETIcon, planet hunters like Mike Brown (whosediscoveries led the demotionof Pluto from planet to dwarf planet), Debra Fischer, and Doug Caldwellwill tell us about the hundreds of billions of unseen planets that pepper ourMilky Way, while media stars Tim Russ (Tuvok in "Star Trek Voyager"),Andre Bormanis, John Billingsley and Kevin Grazier describe their experiencesin bringing such worlds to life on the phosphor screen.? Jennifer Ouellette will tell you about how she putsHollywood sci-fi producers in touch with real scientists (will this mean nomore silver-screen howlers? ), and her husband, physicist Sean Carroll, willruminate on why the arrow of time seems to point in only one direction. AstrophysicistAlex Filippenko will give attendees the truly big picture of our universe ?painting a picture of a cosmos that?s blowing apart faster every day. Apollo astronaut Rusty Schweickart can tell you first-handwhat it?s like to sit in a cramped aluminum can, headed for the moon. He?s gotanother project now: to protect you from untimely death-by-asteroid. Writers? You bet your word processor. Sci-fi legend RobertSawyer will be making the scene, as will Phil Plait and Mary Roach (author ofthe new book "Packing for Mars"). Robyn Asimov promises to tellstories about growing up with her dad, Isaac ? perhaps the most famous sci-fiauthor of all time. Of course, SETI Institute scientists will be at the con, andas abundant as kudzu. I?ll be giving a talk on what will happen if we detect asignal from extraterrestrials, and Jill Tarter (the model for Jodie Foster'scharacter in Contact) will tell you how you can be part of the search byusing your eye and brain to scan data coming from the SETI institute's newAllen Telescope Array.? In the course of the next two dozen years, this array couldincrease the number of star systems checked out for signals by a thousandtimes. On Saturday night, you can tuck in your bib at a banquet inhonor of FrankDrake, the man who organized the first experiment to eavesdrop onextraterrestrial transmitters 50 years ago. I?ve known Frank personally forthree dozen years, and I can assure you that he?s not only a pioneer, but oneof this planet?s cleverest, gentlest guys.? If he were the only presenter atSETIcon, it would still be worth attending. Science will, of course, never make sci-fi obsolete, willnever overtake the imagination of those who can peer into the future and seestories and situations that are far beyond our present ken.? But there?s neverbeen a time when the search for life beyond Earth ? a staple of the genre ? wasmore informed by real science. For this reason alone, SETIcon promises to be anevent unlike any other.? SETIcon will be held at the Hyatt Regency Santa Clarafrom August 13-15, 2010. Information about the convention can be found atwww.seticon.com.